Do you use the hivemind system? UPDATERINO - Got rid of the HiveMind. Back to the good old Apothecarius roots. 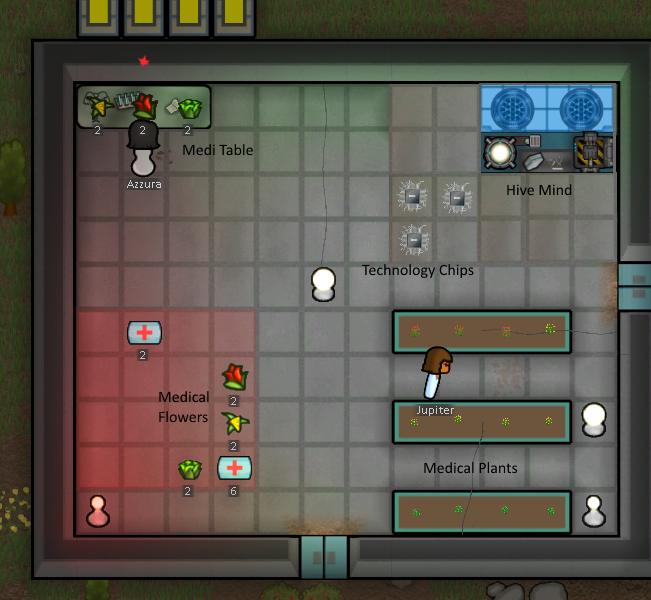 This mod adds a small and straight forward production chain for Medicine made from 3 different 'medical' flowers which can only be grown in the Hydroponics. Bad thoughts because your colonists are starving or have to eat human meat? Not anymore! Give them Soylent Green made from high energy plankton from our seas. Remember - tuesday is Soylent Green Day! Soylent Green - acts as raw food. Cook it for best results. Life Support - keeps your Colonist alive even if he loses a vital organ. Its a very basic technology but better than dead. Eye ball transplants. You can remove eyes and reinstall them now. I think those are in the base game already.. cant remember.. Producing medikits feels a bit cheaty but god knows you need them alot in this alpha! Also I need help with the textures - the current ones were "borrowed" from all over the Internet. Could you maybe make a version for mac? Please? Mods should work on Mac either way. The only case where they shouldn't is IF they include an assembly (which this mod doesn't) and if that assembly calls OS specific code which it really shouldn't have need for. Thanks. Will try the mod as soon as I can. Yes it might be a little bit cheaty thats why I tried to put the entry costs for the mod reasonably high. Also you need 3 kinds of flowers and Hydroponics and power to make the Medicine which I think is balanced to buying it from the traders but Im open for balancing suggestions. Thank you very much for the textures. I love them. I will incorporate them immediately. Oh this is so good...! Feels like my grower become a druid, mixing up magic potions! Awesome! Thanks for your report - I tried it with my own old savegames and it works fine. Are you playing with Alpha 6? Maybe some other mods that interfere with JobGivers or anything? Did you research the Medical Crafting? Did you enable the Apothecarius job in the Overview window? Flowers are Hydroponics ONLY. Sometimes the game forbids ingredients in the Bill config for weird reasons. Re: [MOD] (Alpha 6) Apothecarius + Learning UPDATE (17.08.2014) People now literate! Is the learning for more "knowledge" in other subjects without doing all the hard work? Well, who is to say those books, in that universe, aren't edible, granting knowledge via digestion?! Thanks for that hint I will have a look at that. I didnt test the trader to be honest I just called it with force incident from the development console. Maybe I derped at something or you were just unlucky.